The Visiting Writers Series would like to invite you to their next on-campus reading. 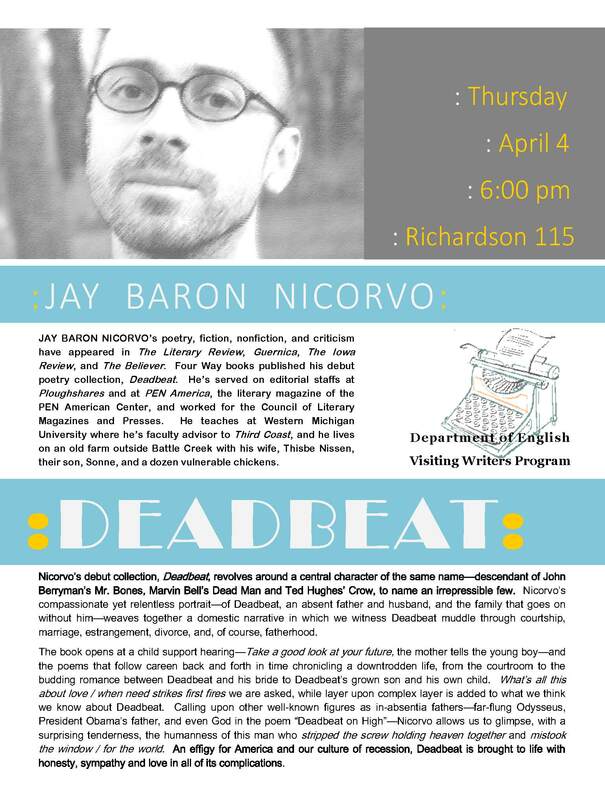 Jay Baron Nicorvo will be reading from and discussing his debut poetry collection, Deadbeat, on Thursday, April 4th, at 6:00 p.m. in the Richardson Library room 115. Nicorvo’s debut collection, Deadbeat, revolves around a central character of the same name—descendant of John Berryman’s Mr. Bones, Marvin Bell’s Dead Man and Ted Hughes’ Crow, to name an irrepressible few. Nicorvo’s compassionate yet relentless portrait—of Deadbeat, an absent father and husband, and the family that goes on without him—weaves together a domestic narrative in which we witness Deadbeat muddle through courtship, marriage, estrangement, divorce, and, of course, fatherhood. Jay Baron Nicorvo’s poetry, fiction, nonfiction, and criticism have appeared in The Literary Review, Guernica, The Iowa Review, and The Believer. Four Way Books published his debut poetry collection, Deadbeat. He’s served on editorial staffs at Ploughshares and at PEN America, the literary magazine of the PEN American Center, and worked for the Council of Literary Magazines and Presses. He teaches at Western Michigan University where he’s faculty adviser to Third Coast, and he lives on an old farm outside Battle Creek with his wife, Thisbe Nissen, their son, Sonne, and a dozen vulnerable chickens. All Visiting Writers Series events are free and open to the public. In Faculty News: Please join the DePaul English Department in congratulating Amina Gautier on her receipt of a William Randolph Hearst Foundation Fellowship from the American Antiquarian Society (AAS) in Worcester, Mass. The AAS is one of the nation’s foremost research libraries for American history, literature, and culture through 1876. The Hearst Foundation Fellowship provides support for writers, performers, and artists to do research for their creative projects in the AAS’s collections. Prof. Gautier is currently at the AAS conducting research for a historical novel titled Band of Gideon about three black female members of Gideon’s Band, a group of Northern idealist seminary students, school teachers, and abolitionists who traveled south to help slaves on the South Carolina Sea Islands. Willow Books, the literary imprint of Aquarius Press, in Partnership with the Gwendolyn Brooks Center at Chicago State University is hosting the Second Annual Willow Books LitFest on Saturday, April 6th, 2013, from 8:00 a.m. – 5:00 p.m. at Chicago State University. The Willow Books LitFest is not only a chance to network and commune with your fellow writers, it’s a chance to celebrate all that is great about literature. Work with top writers in the field, make connections and hone your craft. Opportunities at the Willow Books LitFest will include workshops, networking, a book fair, manuscript sessions, panel discussions, public readings, an open mic, and the Willow Books Literature Awards finalists’ reading and ceremony. Kelly Norman Ellis, Director of the MFA Program at Chicago State University will be available to meet with prospective students, and DePaul MAWP alumnus Zhanna Vaynberg will be holding manuscript sessions. Most events are free and open to the public but require registration, as seats are filling quickly. To register, download the registration packet at willowlit.net/willow-books-litfest. You can also download a complete schedule of the day’s events at the same site. This entry was posted in Events, Faculty News and tagged amina gautier, chicago state university, depaul, english, jay baron nicorvo, visiting writers program, william randolph hearst foundation fellowship, willow books, willow books litfest, zhanna vaynberg.